There are many different ethnic groups in the United States. 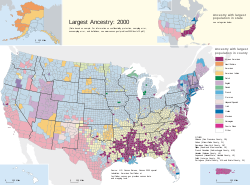 Most people in the United States have ancestors who came from somewhere else, often from multiple places. Some people say their ancestry is "American"; often these are people from the Southern United States whose families have been living in America since before the American Revolution. There are several races in the United States: But Race is not the same as ethnicity. White is the most common race in the United States. It usually refers to people from Europe or the Middle East (such as Germany, England and Italy) Some were indentured servants at various periods of history. Black or African-American refers to people from most parts of Africa. They were indentured servants and slaves at various periods of history. Asian refers to people from countries in Asia (such as China, Japan, South Asia, or the Philippines). Hispanic Americans, such as Mexican, are often of this category. Hispanics can also be any other the other races listed above. Hispanic is an ethnicity not a race. Here are the top ethnic group in the United States. Since many Asian and Hispanic are classified differently, most of the groups listed are white. The most common is German-American, which 42.8 million Americans identify with. Many people came to the U.S. from Germany in the 19th and early 20th century. German American is the most common ethnic group in over half the states. The most number of Germans are found in the Midwest, West, and Pennsylvania. The fourth most common group is English. This page was last changed on 30 October 2018, at 19:04.